The new Agilent J-BERT N4903A 7 Gb/s and 12.5 Gb/s pattern generator options are cost-efficient digital stimuli, enabling quick and accurate characterization and compliance test of high-speed serial interfaces. Design and test engineers can use the J-BERT pattern generators to inject clean as well as worst-case jittered pattern and clock signals into the device under test. 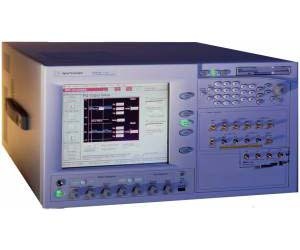 Analysis tools, such as oscilloscopes, built-in error ratios test (BIST), or other analyzers can be used to monitor the behavior of the device under test under ideal and worst-case conditions.